Not wanting to gloat, but I can't help feeling quite proud of this chap. 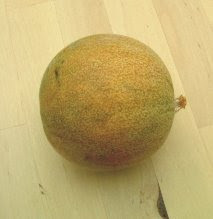 It is the first melon I have grown. Might be a bit on the small size, something the size of a tennis ball still I had a great affection for 'Junior'. We ate him for lunch the other day.